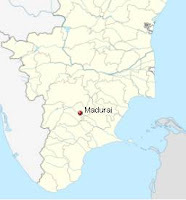 The city of Madurai in the South Eastern Indian state of Tamil Nadu is one of the oldest continually inhabited cities in the world and has been a functioning metropolis for over two thousand years. 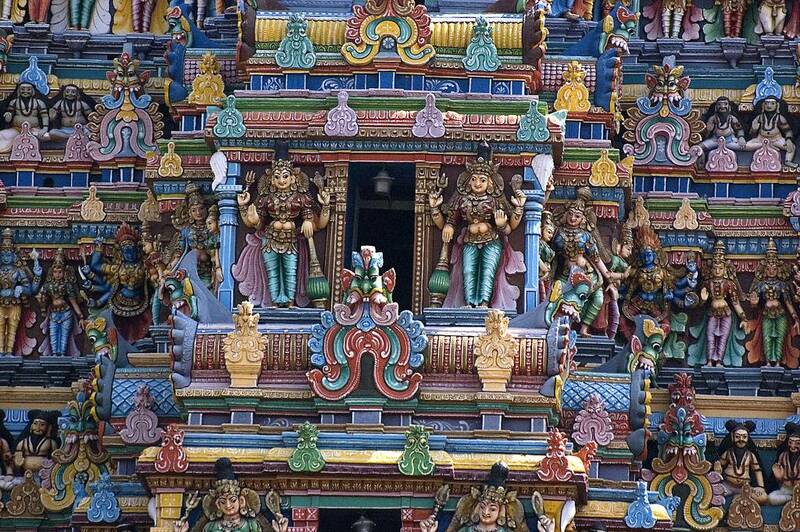 At its heart lies something extraordinary – a temple to the Hindu Goddess Parvati and her husband consort, Shiva. 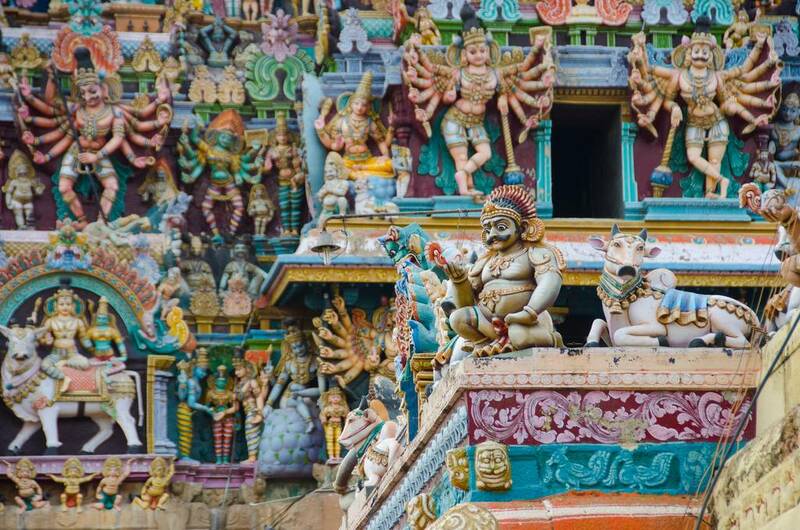 The vast temple complex is guarded by ten gateway towers, known as gopuram. 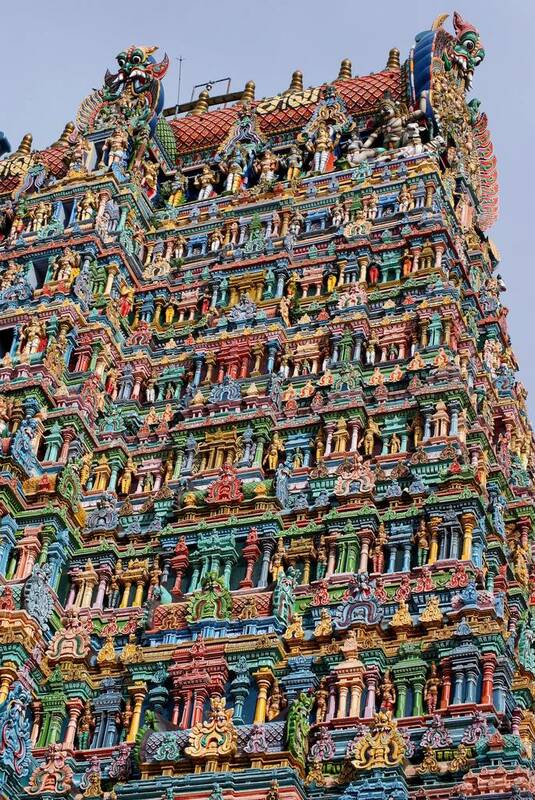 The tallest of the ten is the south tower which was built in 1559 and stands over 170 feet tall. 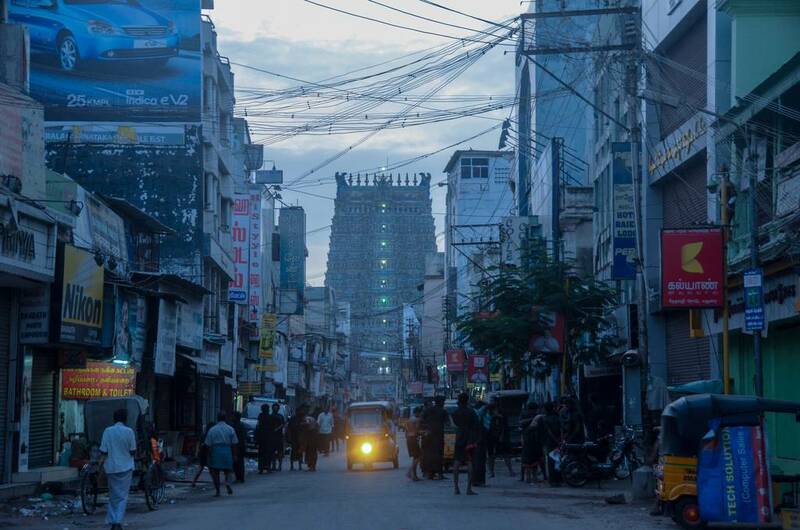 The most antique is the eastern tower which dates back to 1216 built several centuries before Columbus sailed away to discover a faraway land. 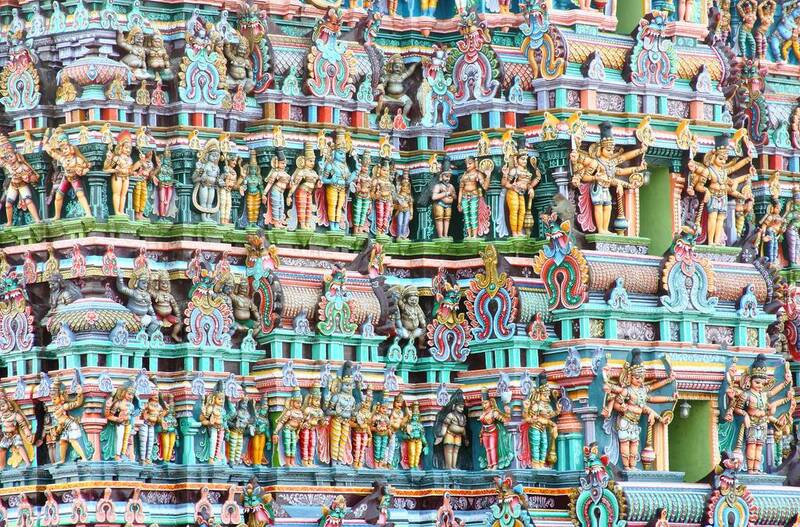 Each of these amazing multi-storied, visually dazzling towers is covered, (drenched almost seems an appropriate word) with thousands upon thousands of stone figures. 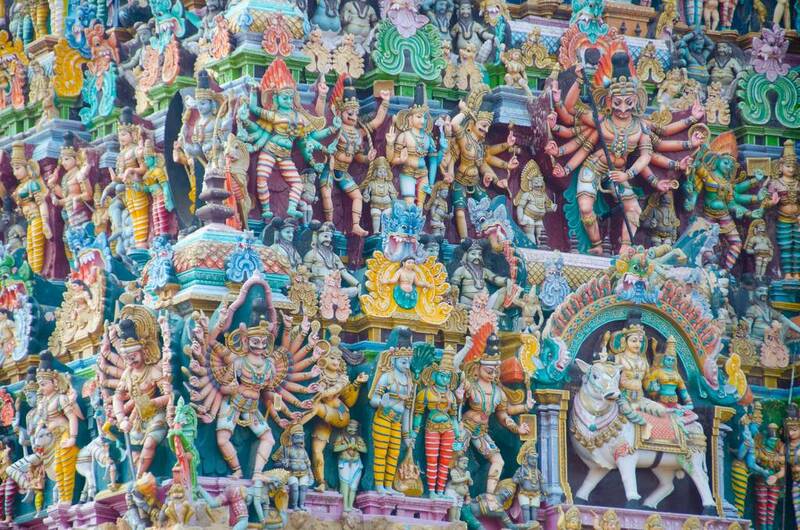 These represent the animals, demons and gods of Hindu tradition and are designed to create the maximum visual impact, both from near and afar. 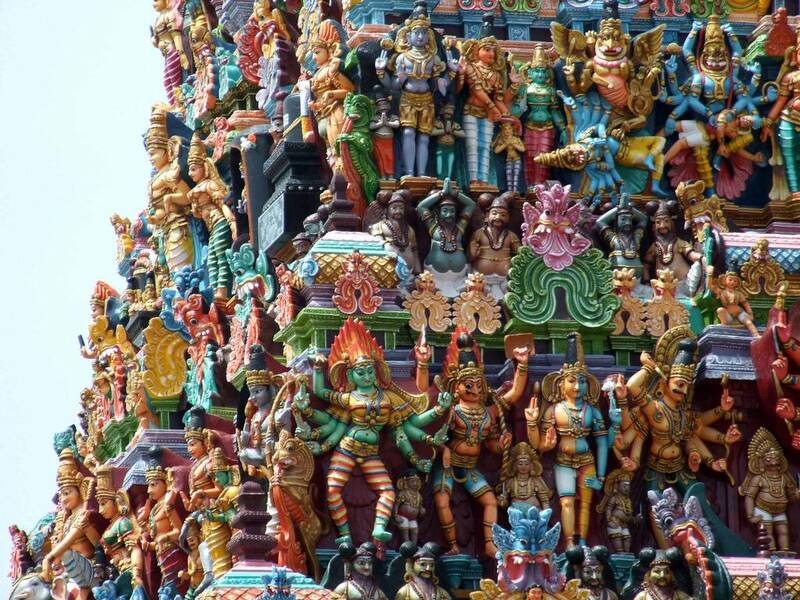 The result is something which is almost impossible to take in at a glance – a visual cornucopia of the bounty of an ancient religion and a culture which has thrived for millennia. 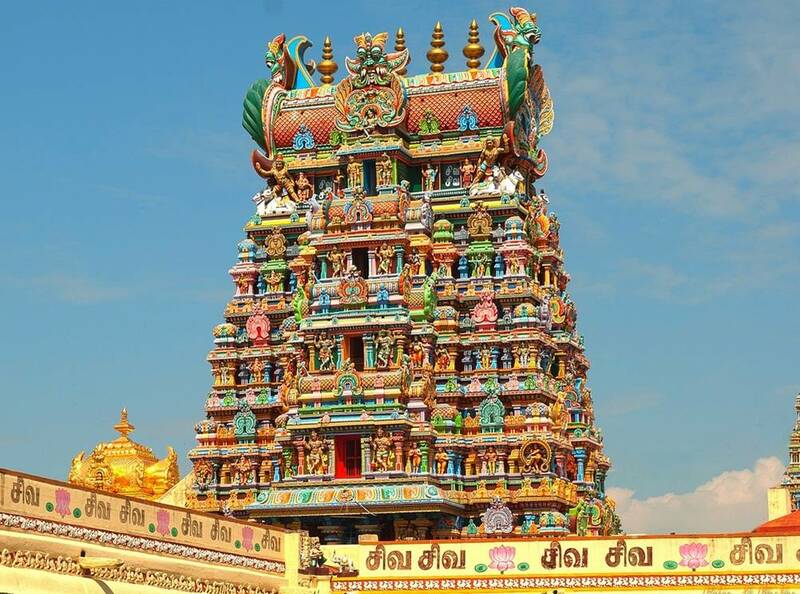 Although what is seen today is, at most, six hundred years old the temple has been mentioned in the literature of the Tamil people, the major ethnic group living in Tamil Nadu, for thousands of years. Today’s statistics are staggering – each day over 15,000 people process through the temple and on a Friday that figure doubles. 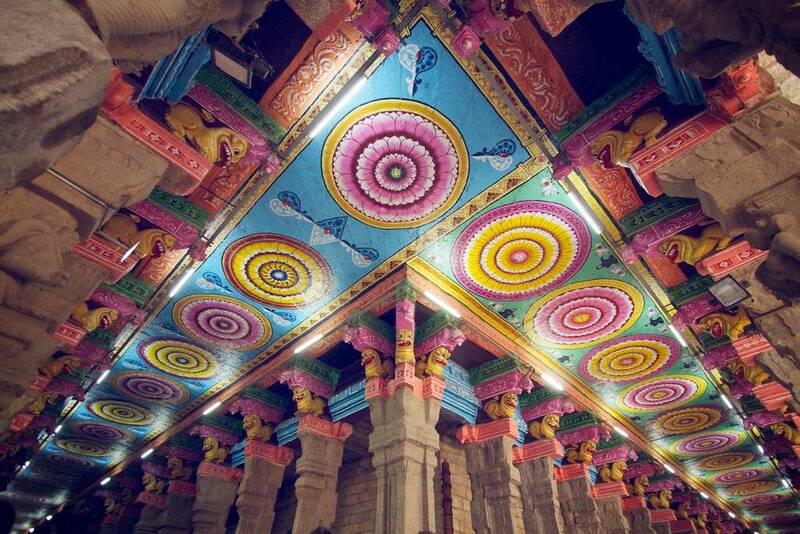 The most important festival which is in April or early May brings over a million people to the temple and its complex. 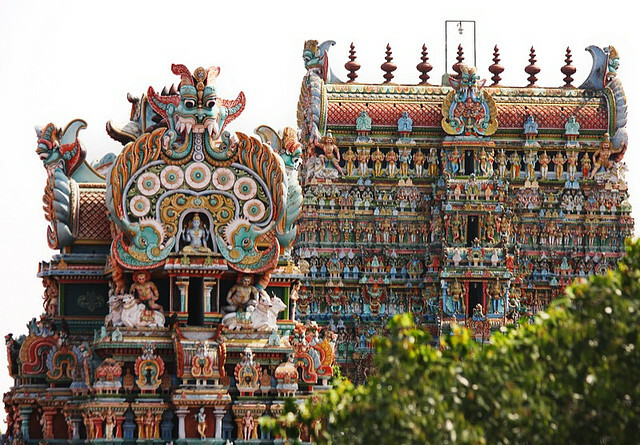 Unusually for a major Hindu temple, the Meenakshi Amman is dedicated to a female deity rather than a male. 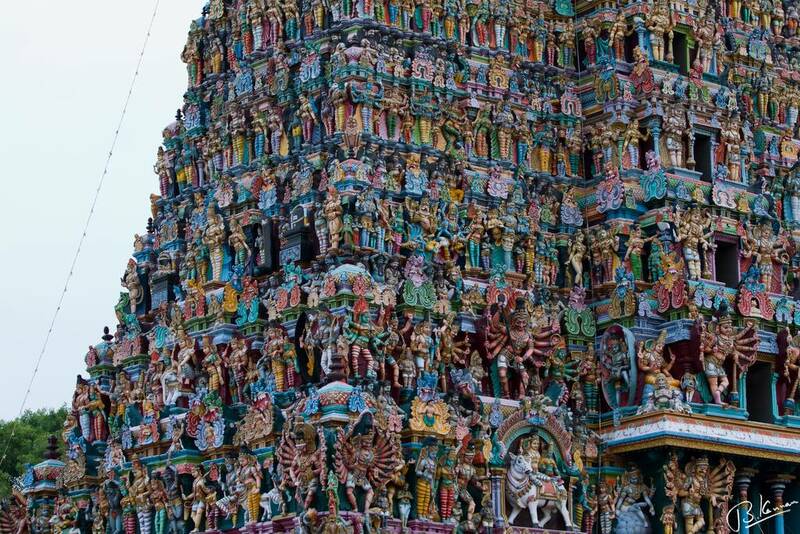 Meenakashi was an avatar of Parvati who was a consort of Shiva (who is considered the Supreme God in the Hindu denomination of Shaivism). 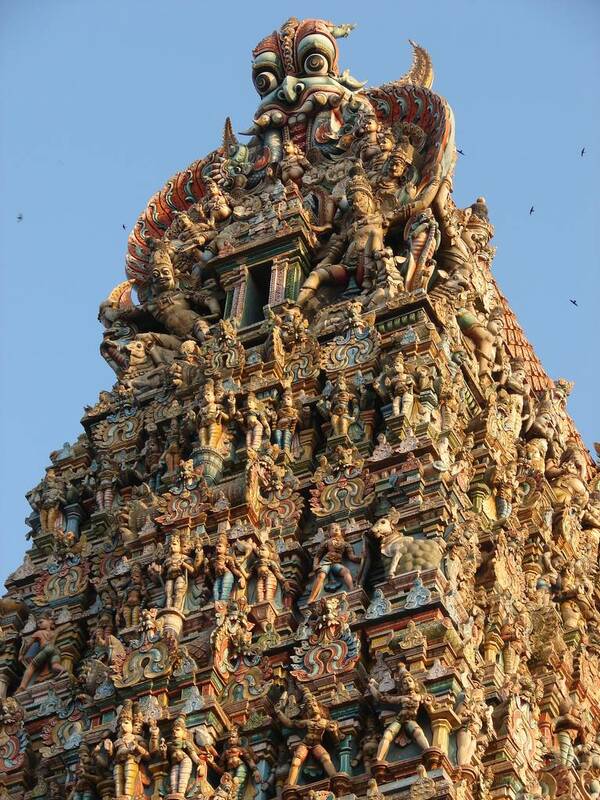 His avatar during Meenakashi’s earthly reign was Sundareswarar. 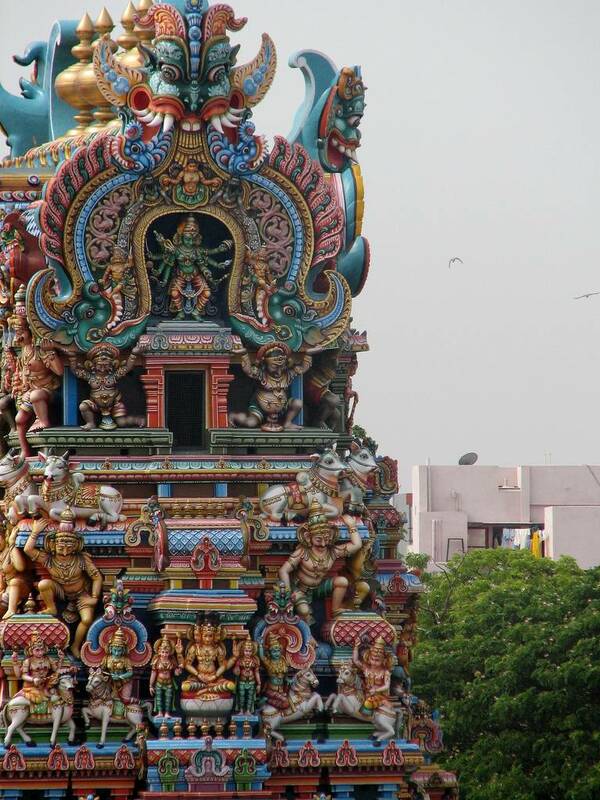 Meenakashi’s name comes from the words mina which means fish and aksi which means eyes. 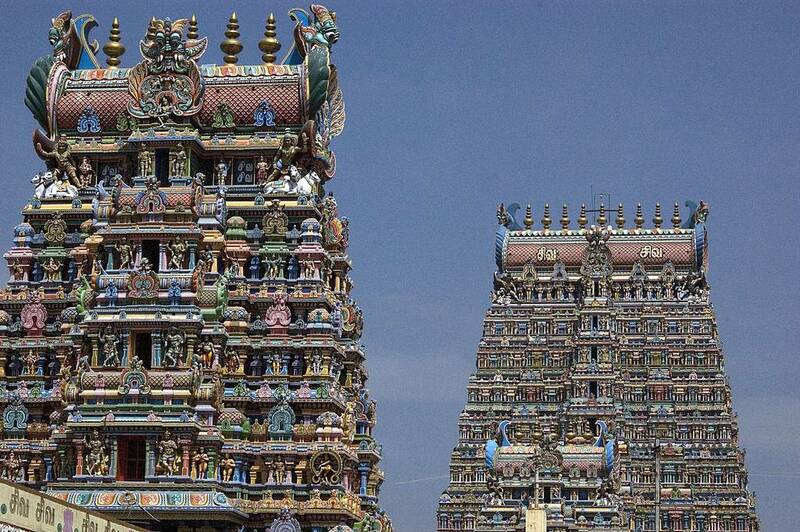 The towers which protect Meenakshi's temple look both ancient and futuristic as they dominate the city's skyline. And sure enough, the being they commemorate had no earthly origins. 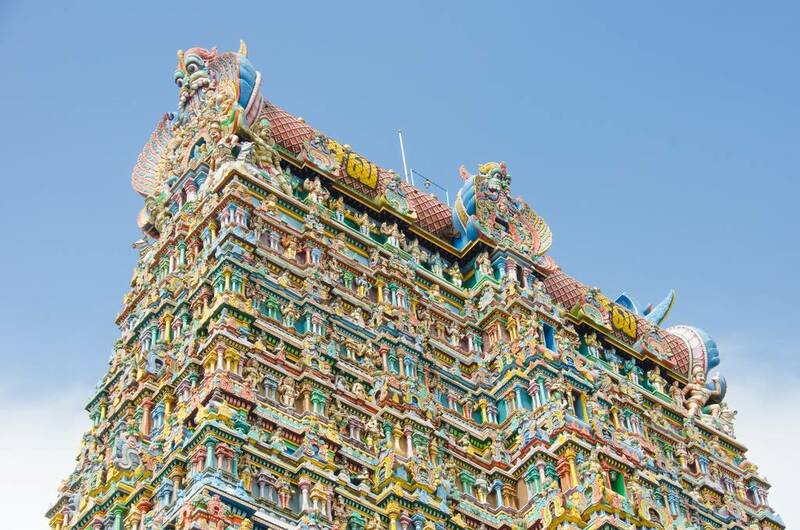 According to legend the goddess Parvati assumed an earthly form in the shape of a girl child, given to King Malayadwaja Pandya and his wife. The girl had three breasts but the king was told that one would miraculously disappear when she met the man who was to be her husband. 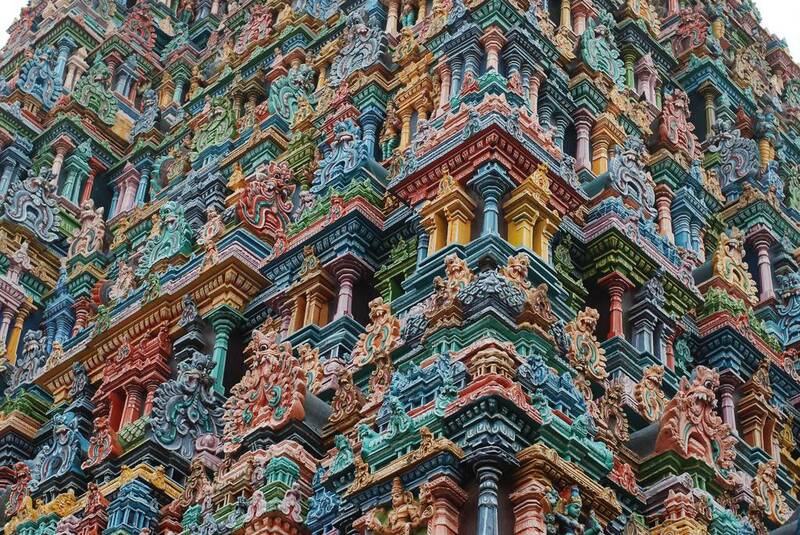 The king carefully tutored his adopted daughter in the 64 sastras (the Hindu scientific fields) and, of course, the art of war. This tutoring would come in useful as the young princess would have to conquer the ‘three worlds across eight directions’ before her coronation. 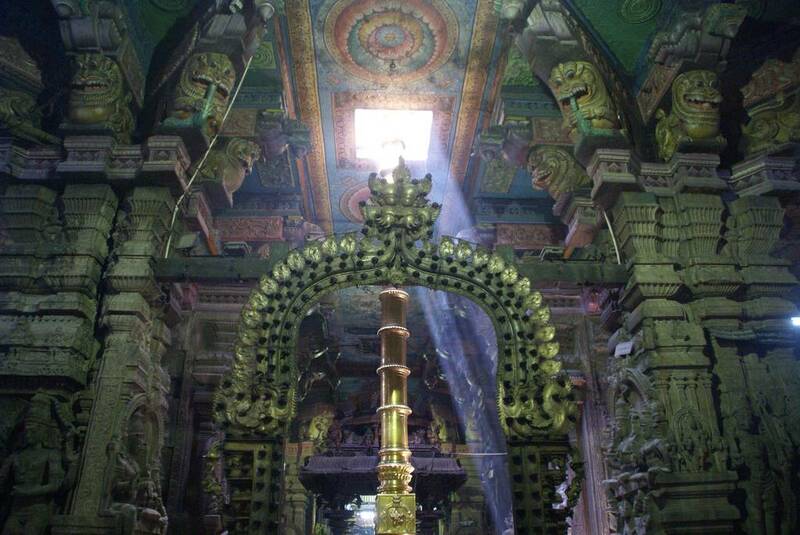 This she did and she was about to claim the ultimate victory when she came close to conquering Shiva. 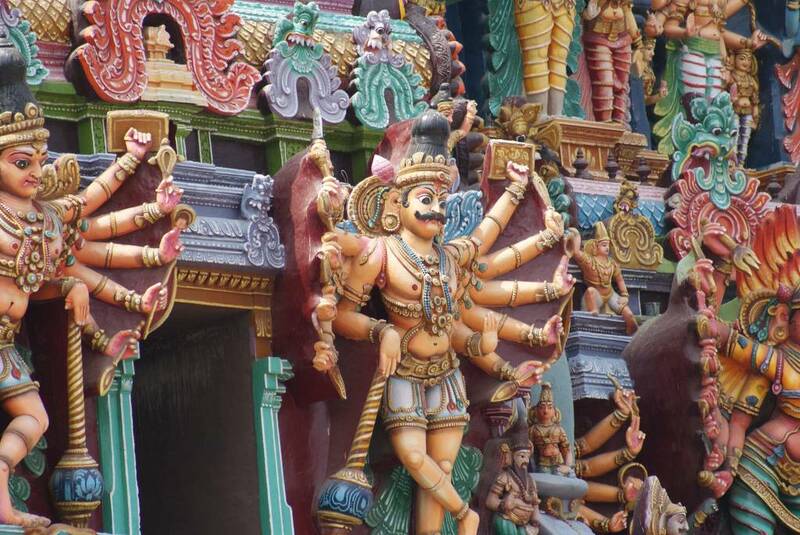 Yet the moment she saw Shiva her third breast disappeared and she realised not only that he was to be her husband but that she was also the earthly incarnation of Parvati. Her coronation was followed swiftly by a marriage. 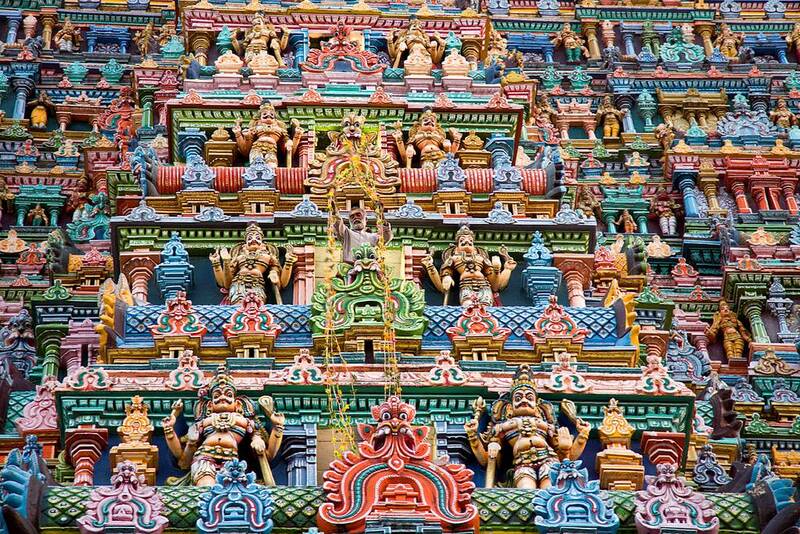 For the wedding nobles from all over the world gathered at Madurai and the pair ruled over the city for many years. 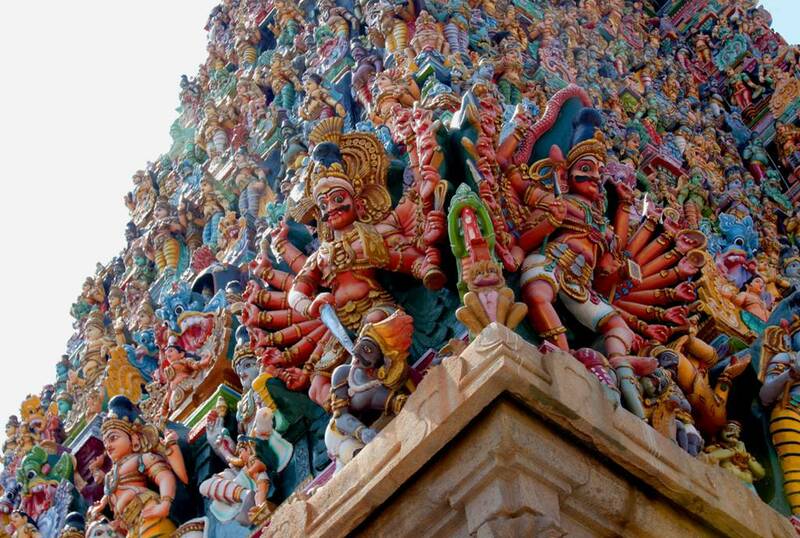 Eventually they took on the divine forms of Sundareswarar and Meenakshi who are the sovereign deities of the temple. 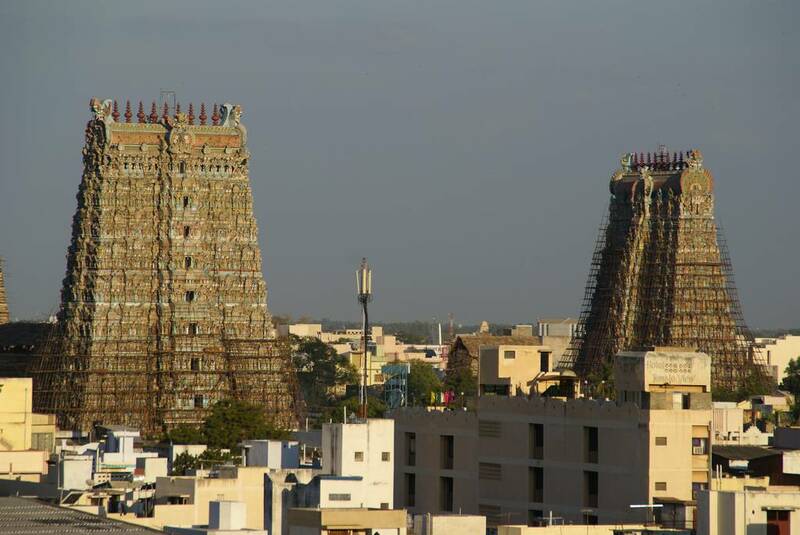 Their marriage is celebrated during the 10 day Meenakshi Tirukalyanam festival during April or May which attracts over a million visitors. 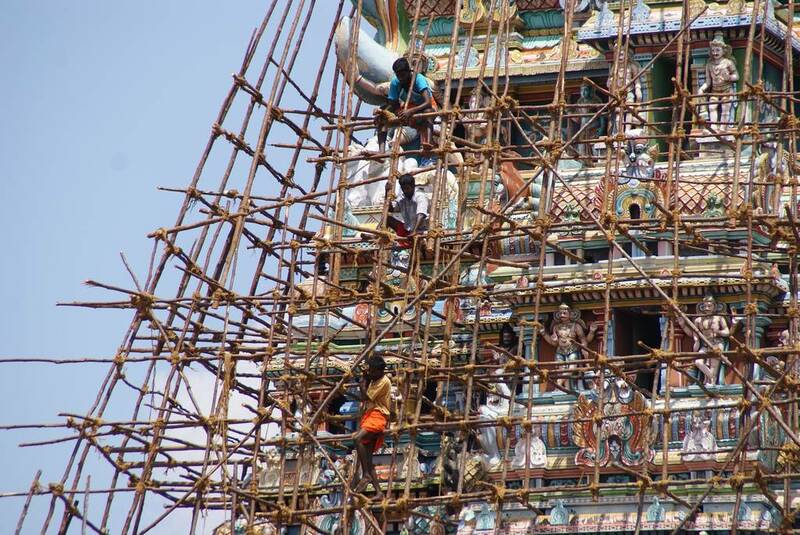 Of course, due to their great age, the job of repairing and preserving the towers is a year round job - not to mention a somewhat precarious profession. 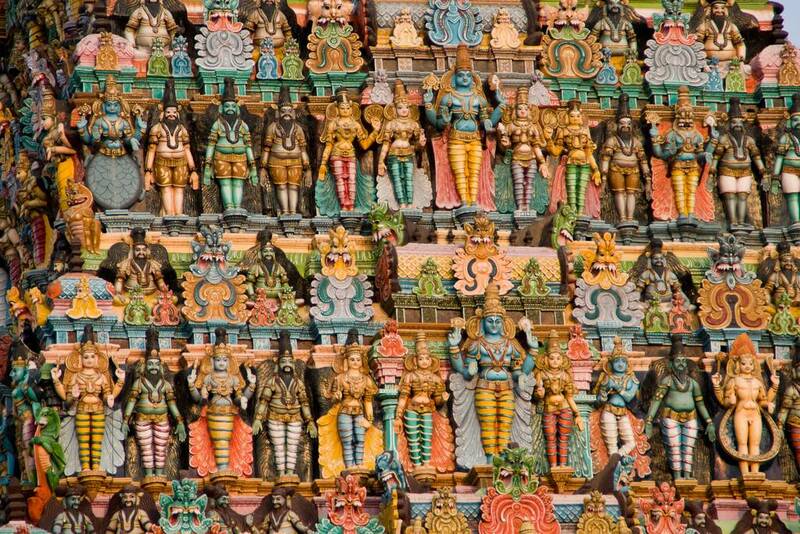 A single man can be so easily lost in this sea of statues.. (did you spot him?). 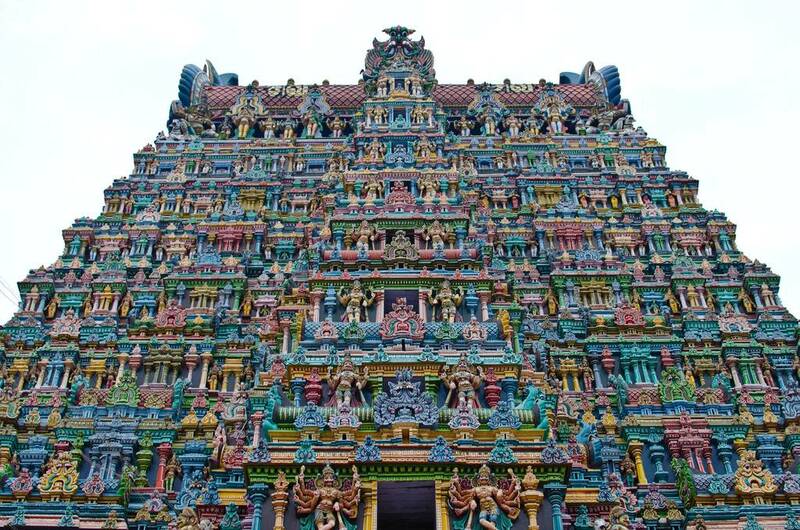 Although the temple is mentioned in Tamil literature as far back as the 7th century it is thought that a religious complex on the site existed for several hundred years at least before that. 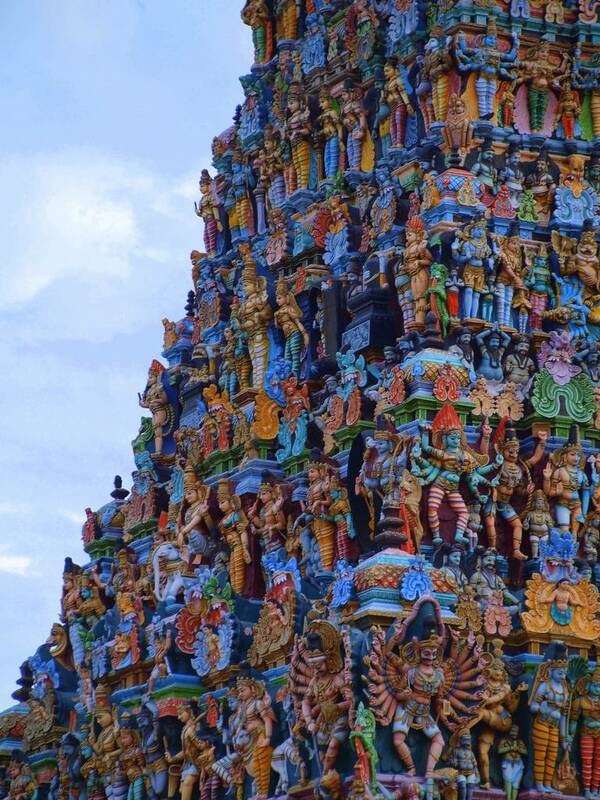 Yet the original complex was mostly wiped from the face of the earth by a Muslim invader, Malik Kafur, in 1310. 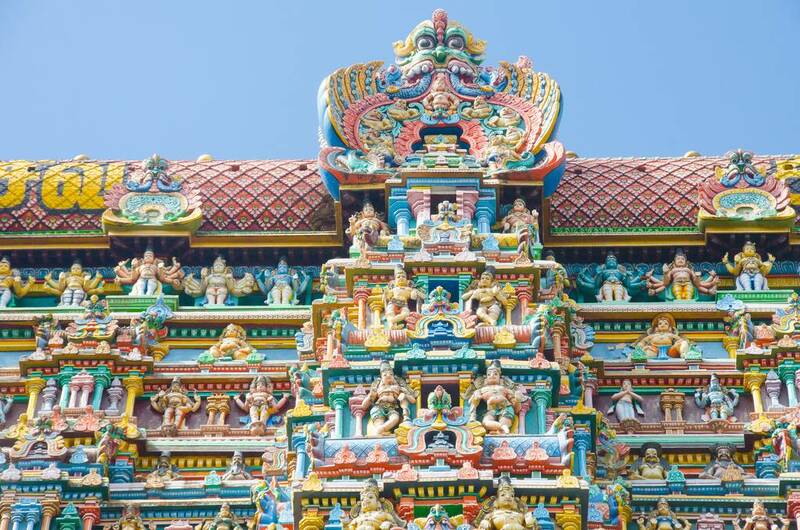 It was not until the middle of the sixteenth century that the decision was taken by the then king of the city, Viswanatha Naya. 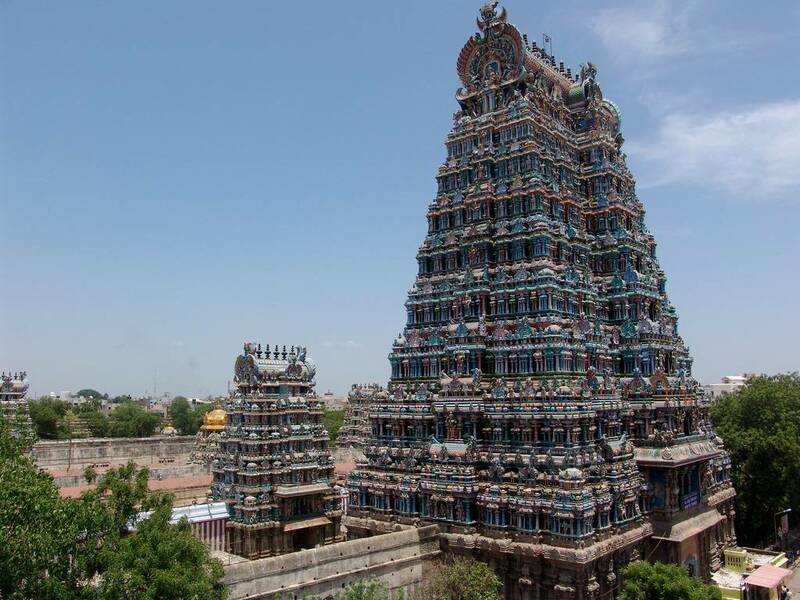 His design was substantially enlarged during the reign of Thirumalai Nayak (1623 to 1659) in to what we can still all see today. 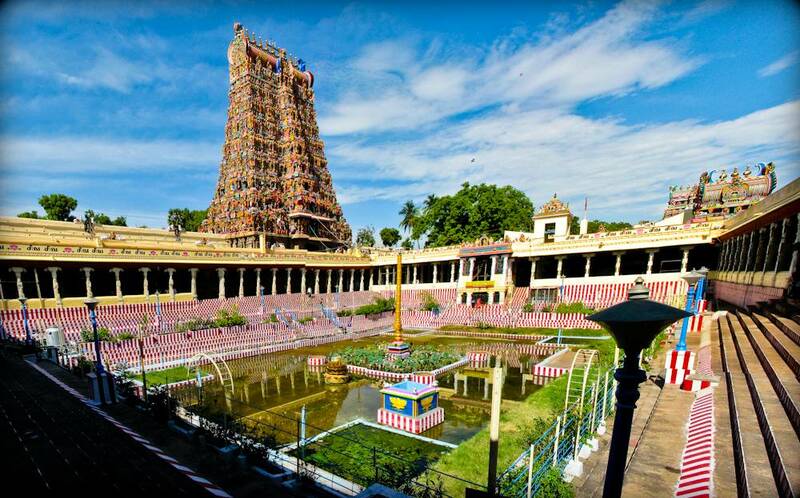 As such the temple is at the very center of the city of Madurai and is set in 45 acres. 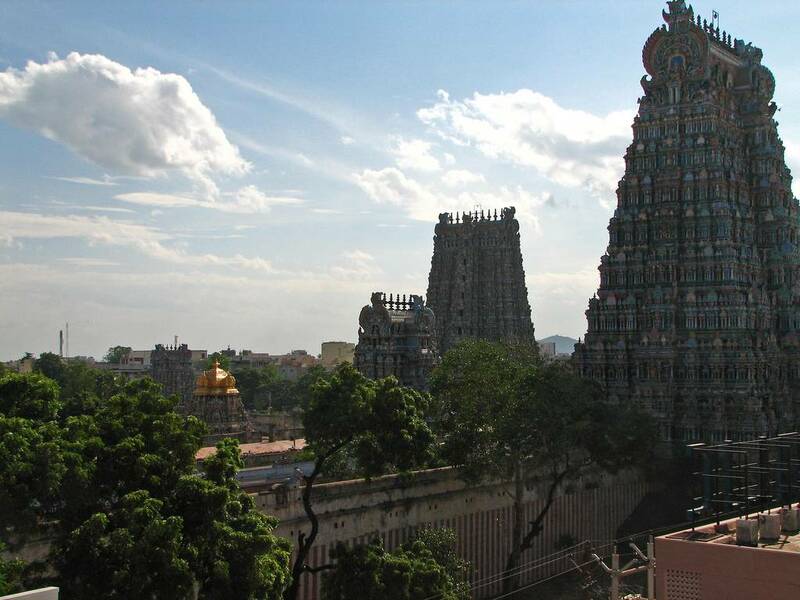 The complex is divided in to a number of concentric encloses each of which is contained by high walls. 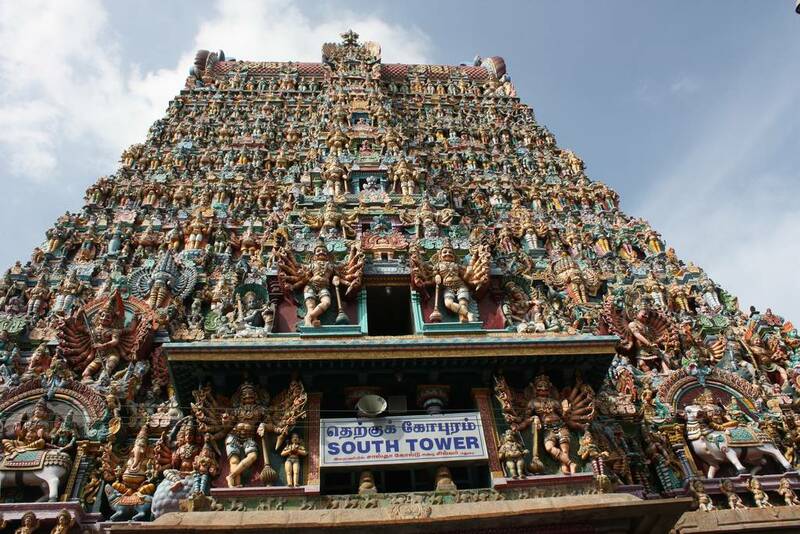 Even though it is the most spectacular, however, it is not the largest temple complex in Tamil Nadu. 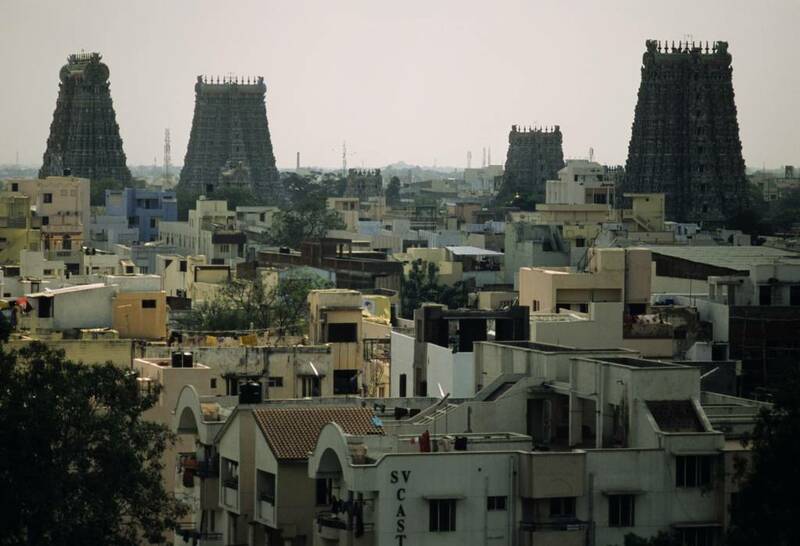 However the rebuilding of the temple in the 16th and 17th centuries meat that progressive urban planning could also be undertaken and all streets in the city radiate from the temple, like a lotus flower and its petals. Inside, your senses too can become easily overpowered. 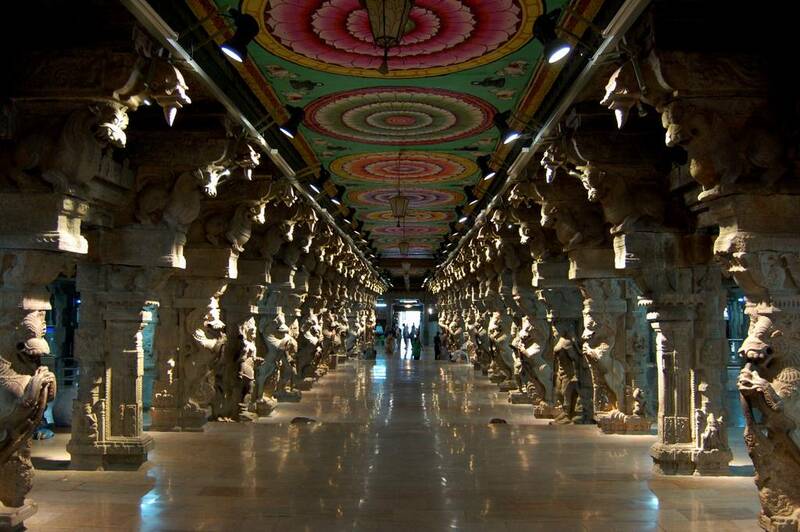 Above is the Hall of a Thousand Pillars. 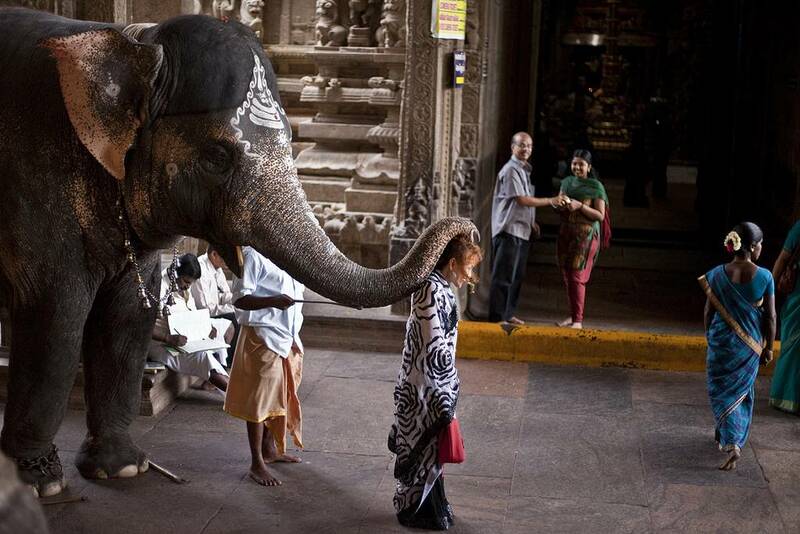 ...and this being India, an elephant is always at hand to give you a blessing. 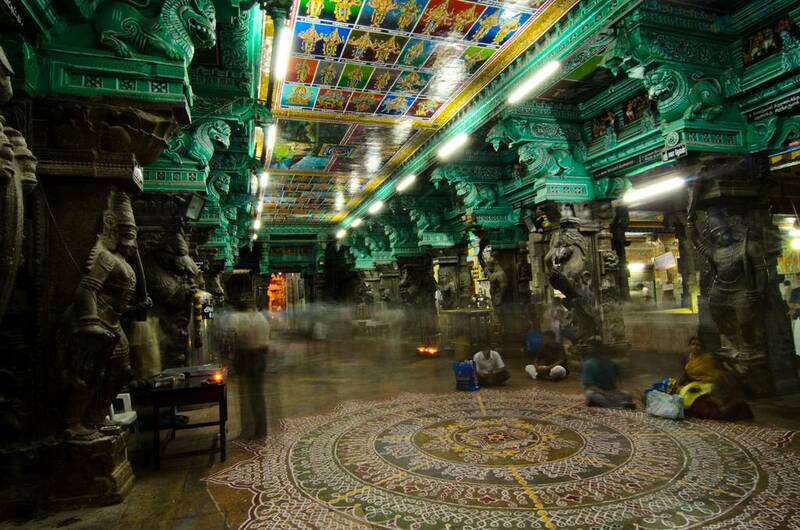 There is also an area known as the Sacred Temple Tank in which people can rest and talk. 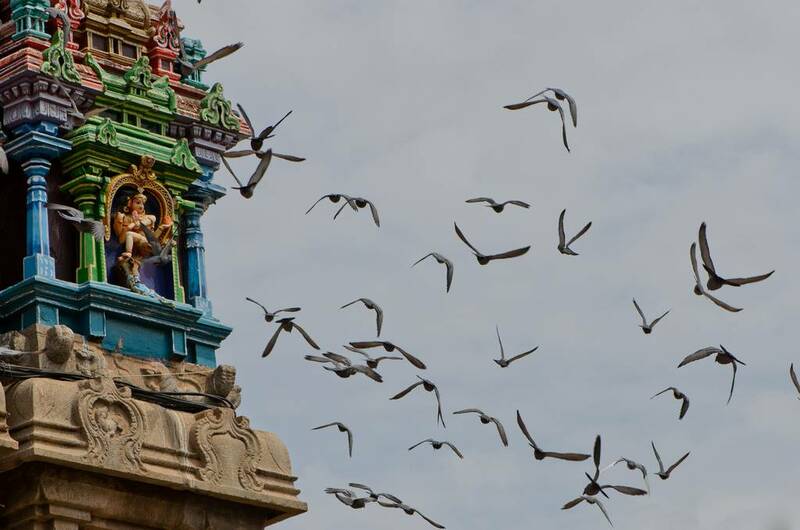 No fish are found in the ponds (or water occasionally) in this area as Shiva promised a local stork that none would find refuge within the temple grounds. Local legend has it that if a book is written the author should place it on the water’s surface. If the book floats then it is deemed a worthy piece of literature. If it sinks then it is back to the drawing board for the hapless writer. 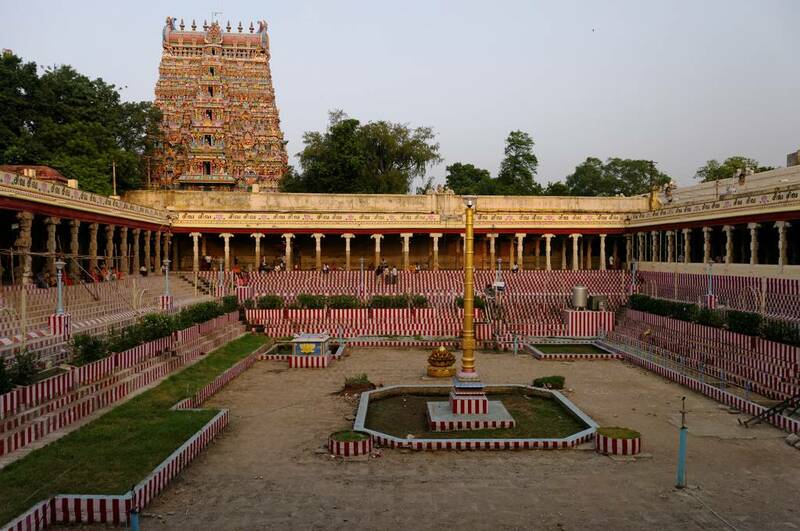 The temple is serviced by 50 monks who belong to the Shivaite to the Adishaivas, a Brahmin sub-caste and they preform rituals throughout the day – and as we assume these a private then there are no photographs of these here. 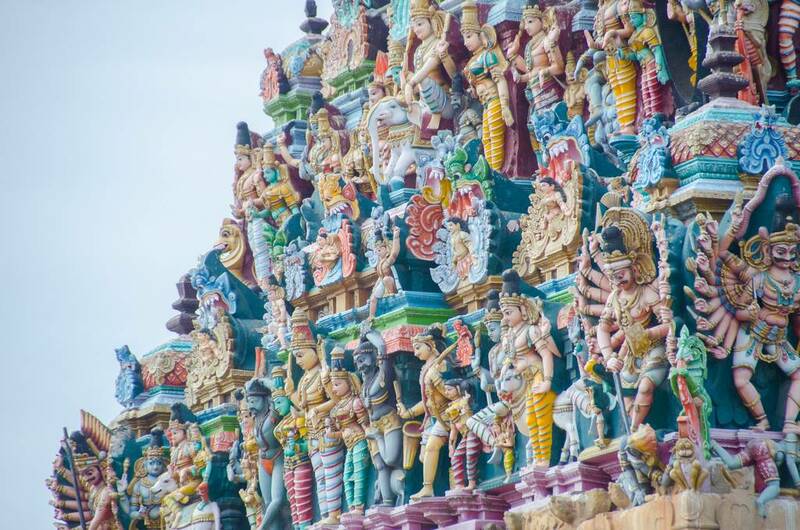 Yet for many the enduring source of fascination at Meenakshi Amman Temple will be the thousands upon thousands of stone figures which adorn the multi-storey towers which guard the temple.